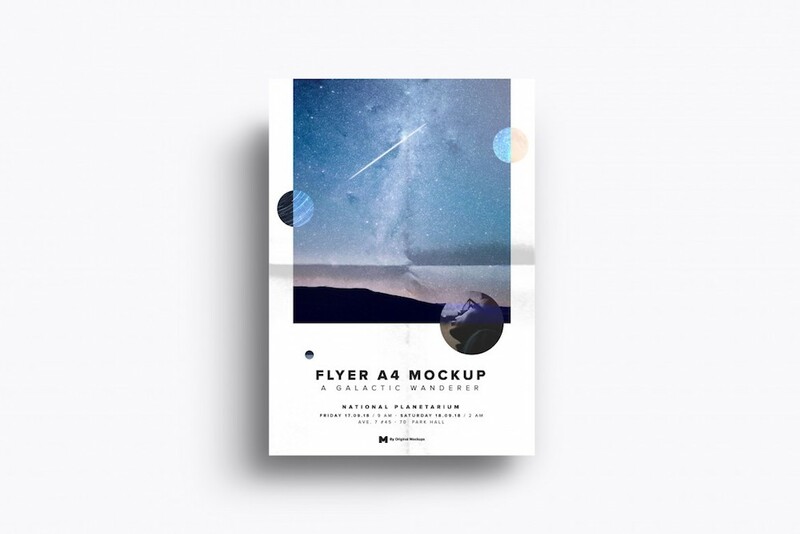 Get your hands on the best free flyer mockups and push your promotion above and beyond. They come as a PSD file with a convenient smart object layer that anyone can get good use of. As a designer, mockup templates are more than ideal to present the advertising material you are working on to your clients. Of course, you can also use them to build your portfolio and bring your professionalism to a different degree. Needless to say, you see flyers everywhere. Someone might hand it to your on the streets, in a shopping mall, at an event, wherever you go, there are flyers. Do they work? Being so widespread, you bet they do! However, since the competition is strong, you definitely need to come up with a unique and stand out design that will capture their interest to actually check it out instead of throwing it in the first bin. 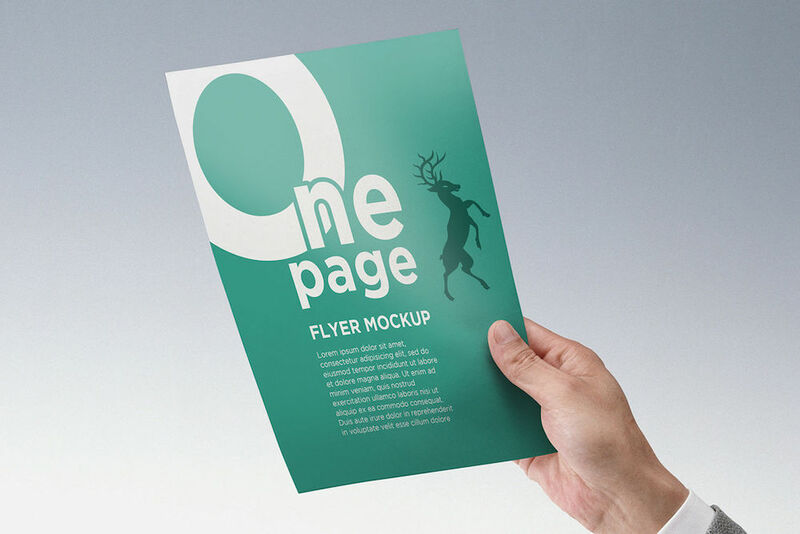 With flyer mockups, you have the advantage to create the ideal artwork for your client before it goes out for print. You two can further brainstorm it and genuinely create a remarkable experience for all the potential clients that will receive it. You can also use the ones you find on this list for inspiration and create a custom flyer template that everyone will be dying to get. If working with a fashion photography business owner, you came to the right place. This flyer mockup is ideal for the purpose, and you can effortlessly edit it according to the requirements and regulations. You can easily change colors, texts and images to make it follow their demands. It is a simple to use layered PSD file that offers everyone to see amazing results. Even if you have just the basic Photoshop knowledge. 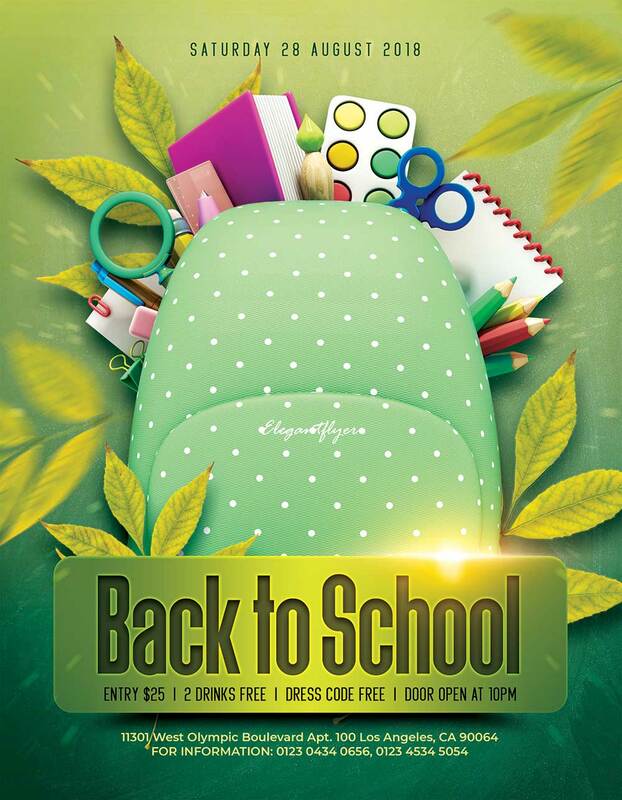 No doubt, the outcome is guaranteed to be a fantastic preview of the flyer. They will definitely have a clear understanding of how the final product will appear after it comes back from the print shop. 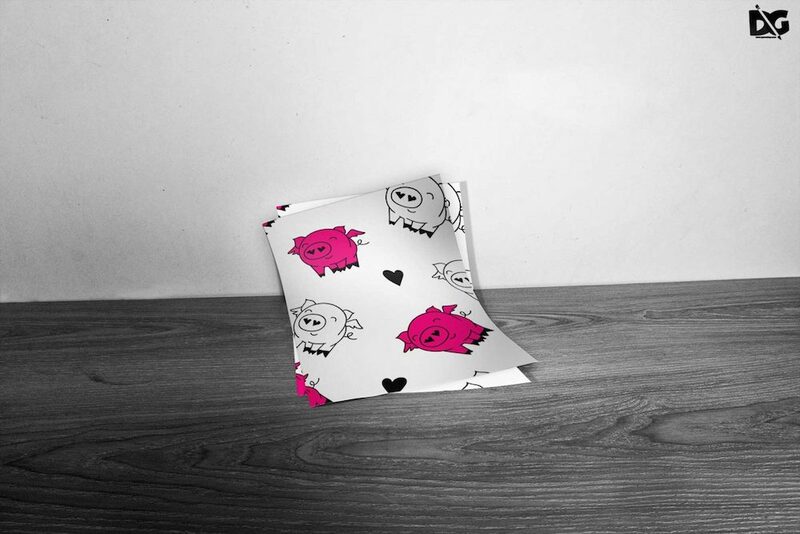 Simple and attractive flyer mockup with happy pig pattern in white, pink and black. 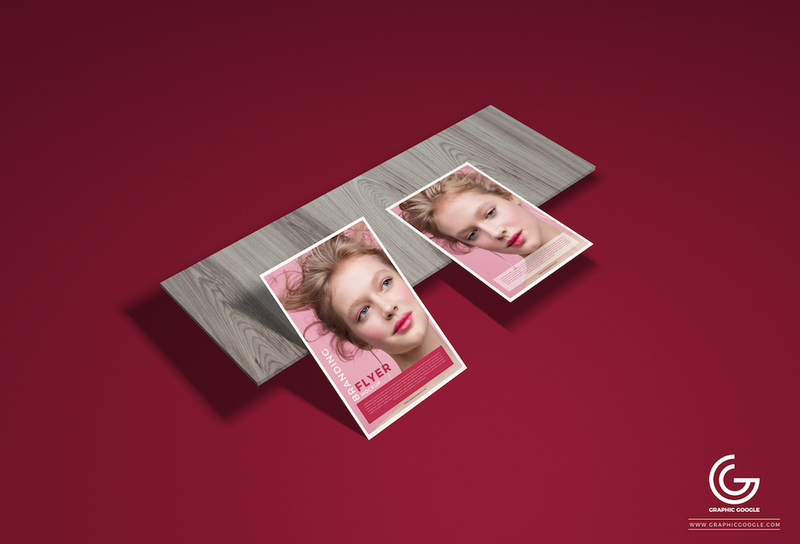 You can edit both the front and the back leaflet and let the wooden floor make it appear even prettier than it already is. Download this free sample now, use it with Photoshop and benefit from the easiness of the smart object layer. Once you get the gist of it, you can start producing numerous fantastic flyer designs and their lifelike presentations almost on autopilot. Besides, you can use it both for personal and commercial projects at free will. Jump on board and start making moves. 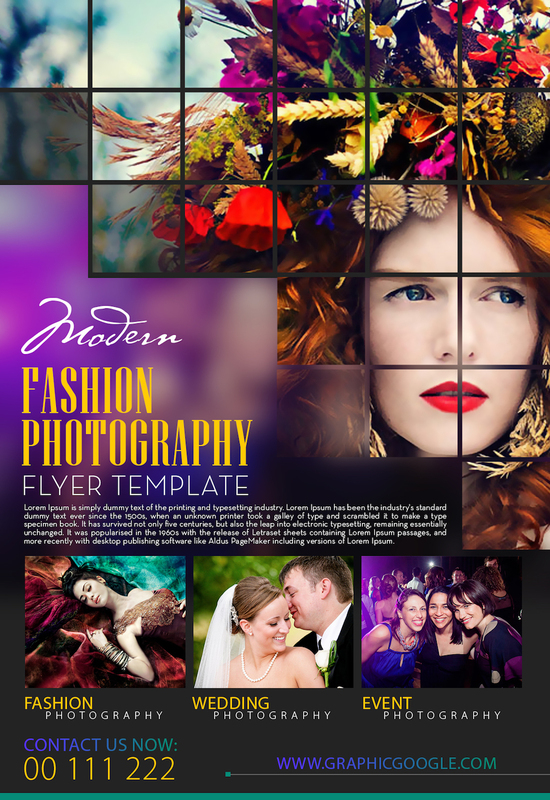 You will surely capture your client’s attention after you add your artwork to this free flyer mockup. You can create both an A4 or an A5 version, depending on what they are after. The shading and the creases of this template give a really photo-realistic experience that everyone enjoys. 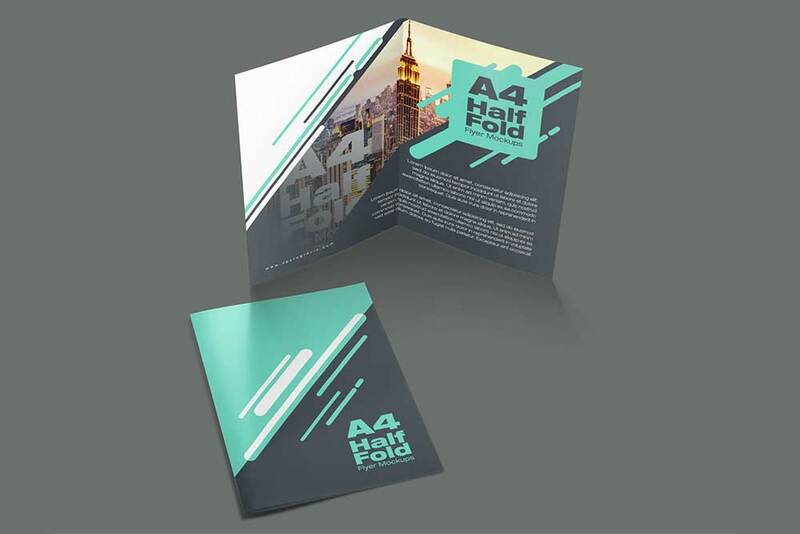 Simply attach the leaflet design you were working on and see its online printed version of it. Do you think it needs some final refining touches? If so, now is the right time to perform them. Even if they would like to add some more information on the flyer, make it now before it is too late. Flyers are, no doubt, still a very popular marketing medium. You see them almost everywhere you go. Not only see but there is a high chance someone will hand it to you. Now, what you normally do with it? Do you throw it away the very next moment or you actually take a peek at it? Of course, the artwork is highly important to spark your curiosity. 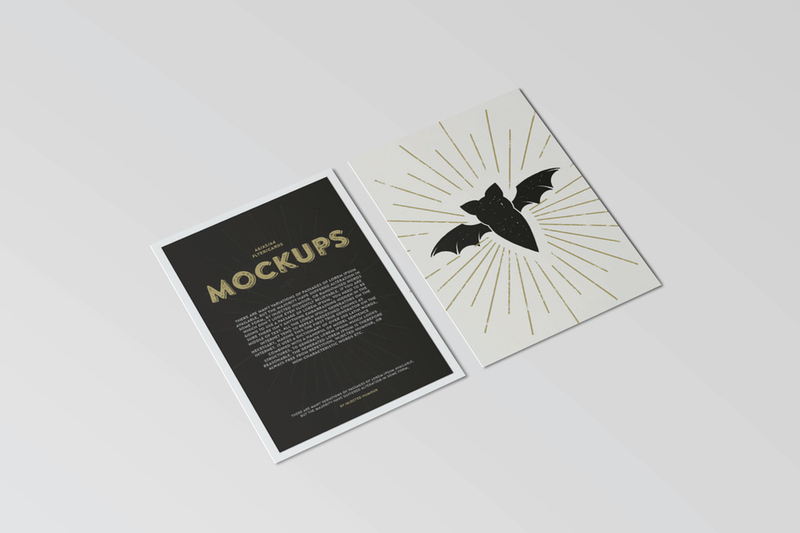 As a designer, one of the best ways to test your creation out is by using a free flyer mockup. Here is one that features two leaflets with two smart object layers. Add your work and see how the printed version would look. You can easily create a bi-folded flyer out of an A4 sheet of paper. After you have the design ready, simply utilize the free flyer mockup and append it. Immediate and fantastic results are expected so take full advantage of it. In this particular case, you get not just one but three different scenes. If presenting it to a client, they will now have a chance to visualize it better and see how their advertisement looks. Even if you are a designer, building your online portfolio, feel free to use a mockup template and showcase your professionalism and precision. To make the presentation of your print advertising design as photo-realistic as possible, all you need is a solid mockup. And if it involves human hands, that’s even better! Would you look at that, here we have the ultimate mockup template for your needs. In addition to that, it does not come in just one style instead, you get three different samples to employ and take to your benefit. Make it special by enriching it with your own work and see the difference occur right in front of your eyes. Download it, it is free of charge after all and get it realized in a snap. 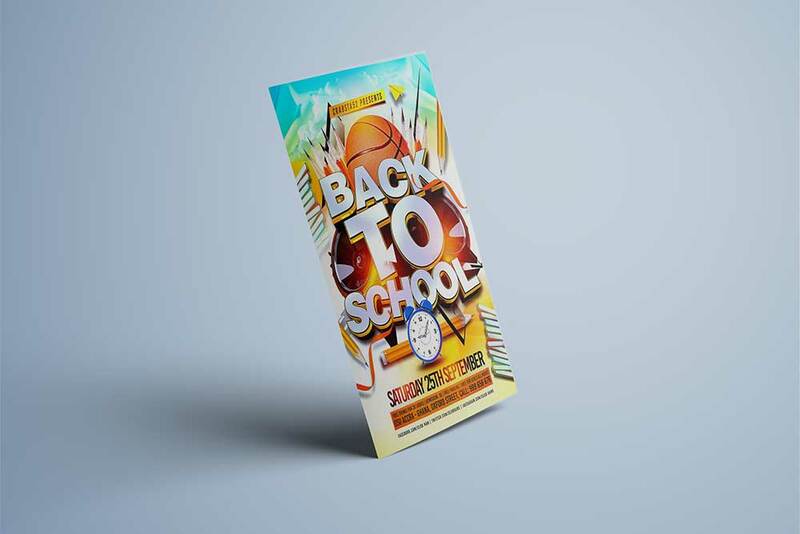 One of the most ideal flyer mockups for you to use with the back to school offer you are currently running. 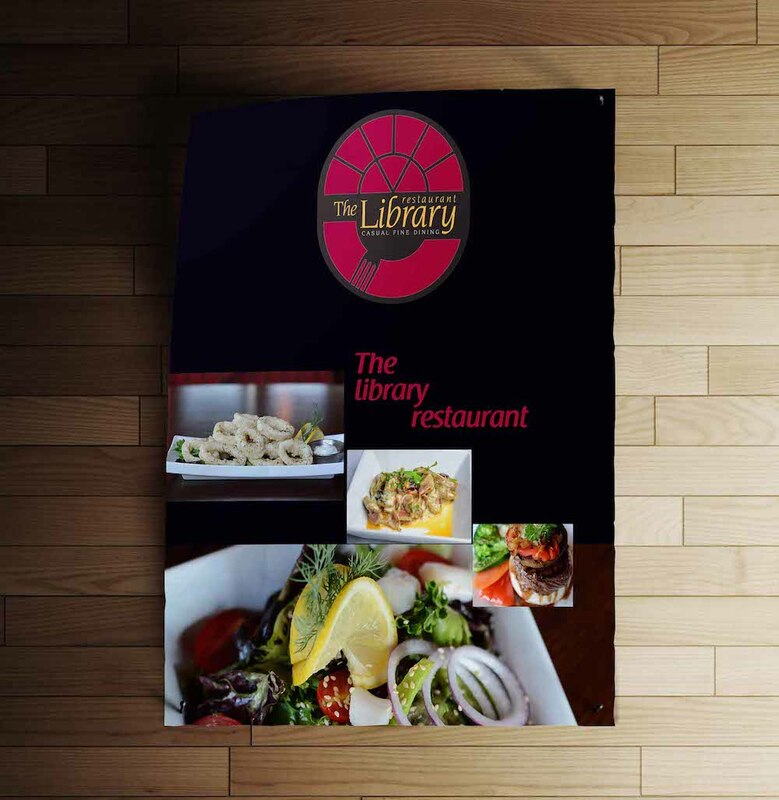 It clearly offers a standout appearance that will get your potential customers intrigued, and that’s what matters most. The template is fully editable and even allows you to add your designs to it. Also, all the elements are organized in separate folders for the ease of use. If you would like to stand out a mile and make an impact, you now know what tool you need to utilize to make it happen. 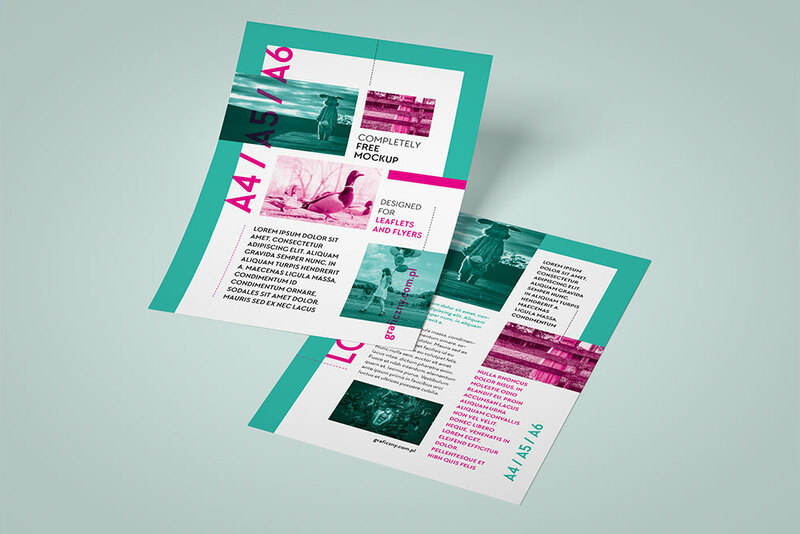 Download the free leaflet mockup directly and make it your own. 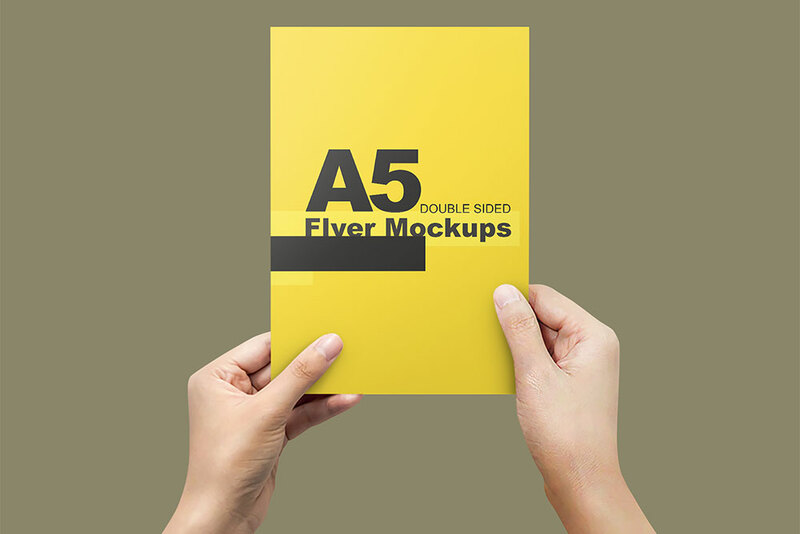 Instead of one, you get five different flyer mockup templates after downloading this free PSD file. That gives you enough freedom to see how your work would appear in its actual printed version. The fun thing about mockups is that you can play around with different variations and styles for as long as you want. Make sure that all is in line before you order one if not ten thousand of them. And with an enticing, modern and sophisticated layout like this one, you can create a visually appealing lifelike presentation that you and your client can study further to come up with the best possible variation. 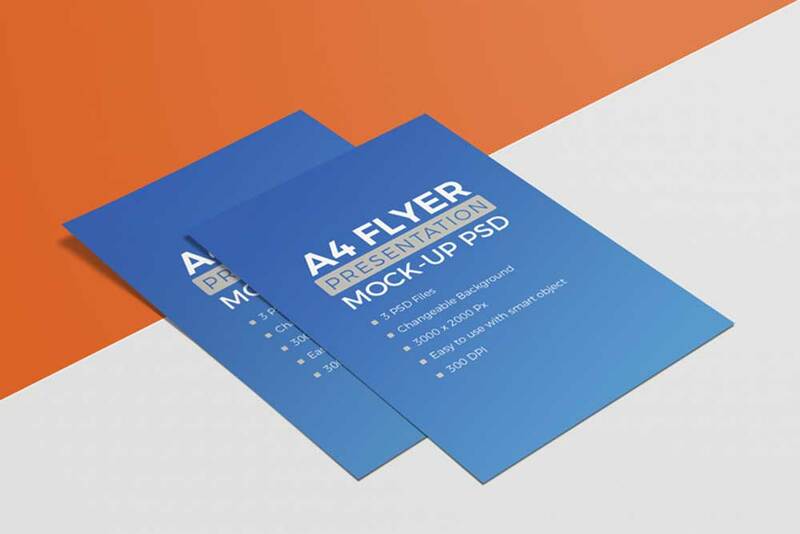 With a set of flyer templates, you can quickly create a presentation for your audience or your clients. If you are building a collection of mockup tools for your designs, this one should definitely be on your list. 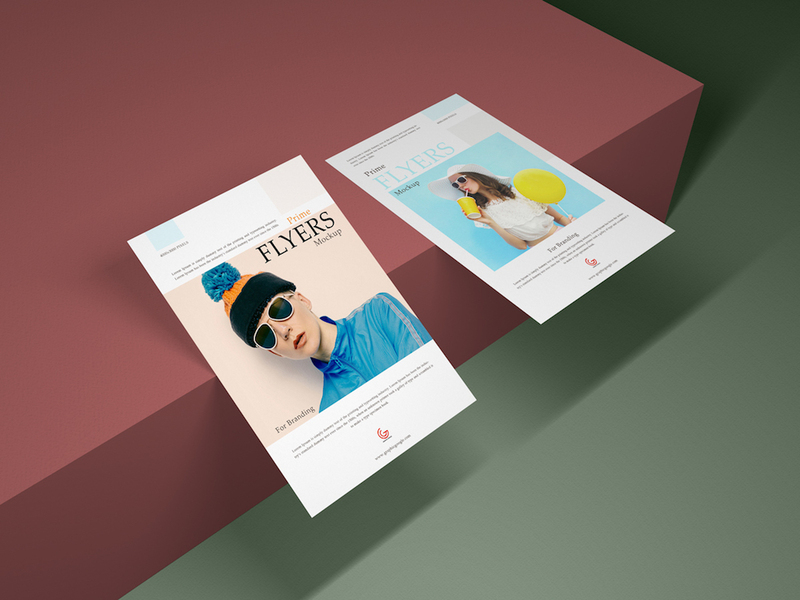 It is a simple, clean and contemporary free flyer mockup which comes in three different styles. Along with changing the actual leaflet design, you can also adjust the background and create a contrasting effect. Make it pop and attain the results you crave with the A4 flyer you are passionately working on for your client. If you are looking for a marine- and sea-inspired flyer mockup, this is probably the best free solution for you. No need to look elsewhere since this one will most certainly do the trick for you, your clients and your customers. 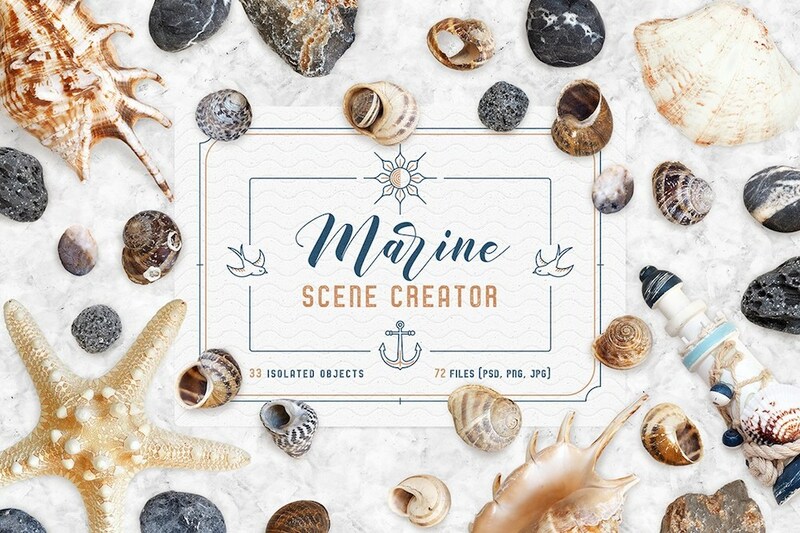 You can use it for brands, restaurants, summer parties or go entirely against the grain, whatever the case, make it shine with this marine scene flyer design mockup. Whoever gets a chance to see it, he or she will be impressed by it 100%. The method of using and editing the mockup is quick and straightforward by using Photoshop and smart object layer. If you are putting together a DL flyer, here is a free mockup you should rush downloading straight away. It comes as a PDF file which you can employ effortlessly. No real need to know any advanced design moves to stuff it with your design and see its lifelike version. Just look for the smart object layer, drag in your artwork and you are done. If it fits perfectly, the design of yours is ready for final realization. Meanwhile, if you or your client believe additional editing is necessary, make alterations now and, again, check the photo-realistic preview with this free flyer mockup. We bring you a broad collection of different flyer mockups for you to present your designs uniquely and wonderfully. On top of that, they cost you nothing. Plus, just like all the rest on this list, you can swiftly edit this one-of-a-kind flyer with Photoshop and smart object layer. The template offers you to add your front and your back design, as well as change the background. In short, you can modify everything to make sure you get as close to the final, printed version as possible. Take it to your advantage and create an eye-catchy demonstration that will wow your client. As a business owner, you might already think about creating your own flyers. Whether you are a startup or you would like to push a special event, consider creating a leaflet and spread the awareness. However, do consider making a flyer that will have them hooked in an instant. 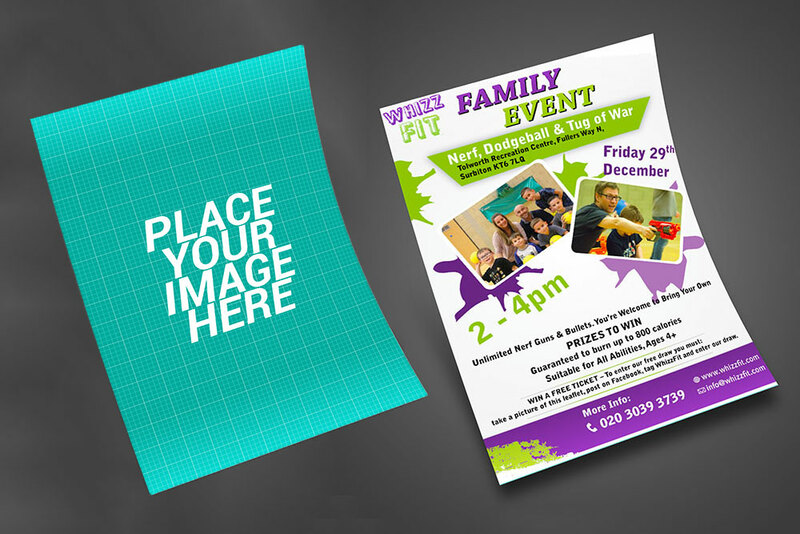 To comfortably achieve the desired results, make sure you test the artwork with a flyer mockup and see how the needed version would appear. 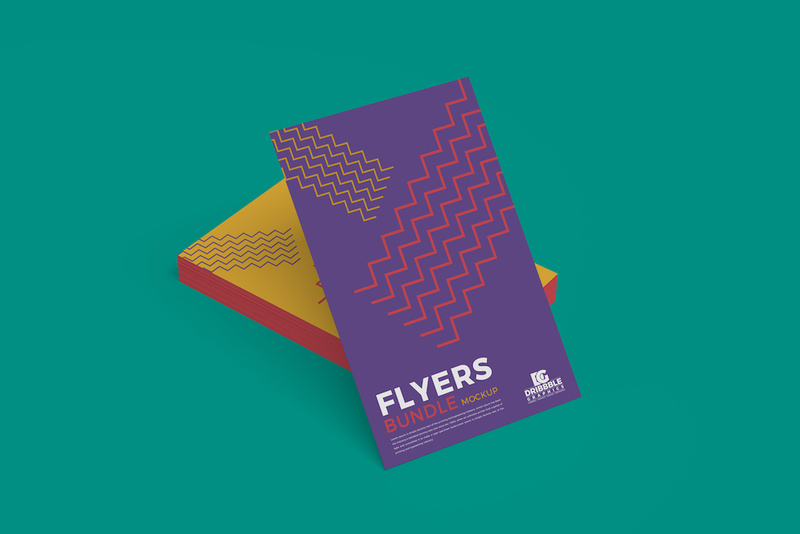 To truly get the best impression, this free flyer mockup provides five different displays of the front and the back of the leaflet. Create a neat preview that will help you decide on the final version. 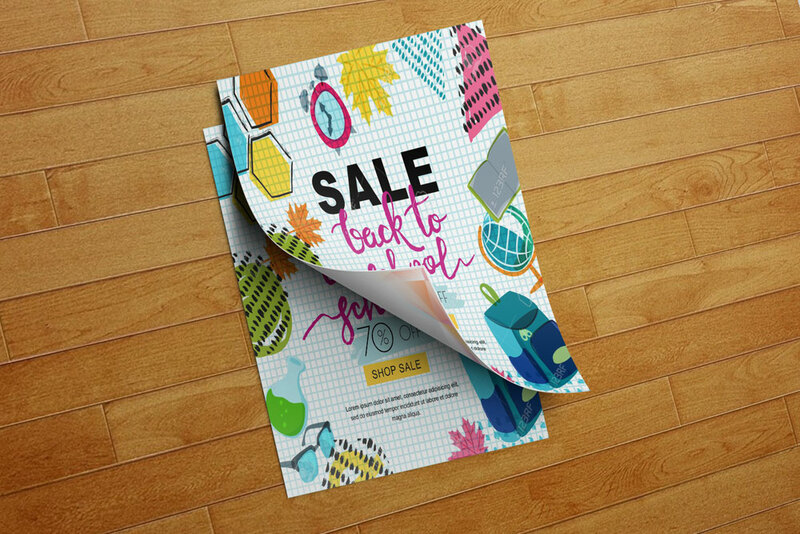 A full front view of the flyer above a stack of leaflets is what you are getting with this free mockup template. Use the bottom bundle of flyers to display the back design or a completely different artwork if that is what you are after. You can also adjust the background to make sure your design pops and is put right in front of the client’s eyes. In brief, do whatever you fancy, the mockup is ready for download now and you can use and reuse it countless times. The dimension of the mockup is 5000 x 3333 pixels to achieve the highest quality presentation possible. This multi-purposeful free mockup is highly adaptable and versatile enough to use it for all sorts of intentions. 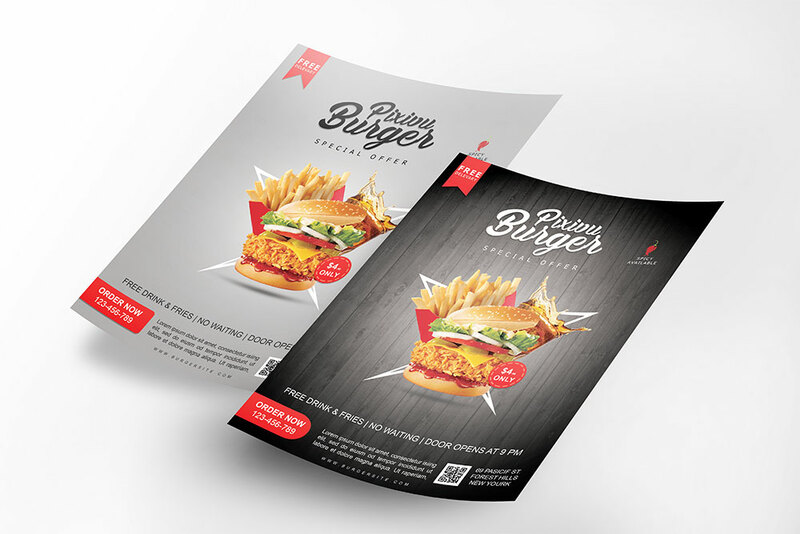 First, you can create a stunning and tempting flyer presentation out of it. Simply add your design to it and you pretty much have the final product ready to roll. What for, you use it, does not really matter since it is your imagination that might be the only barrier you have. Other than Photoshop, there are no other requirements on how to get the most out of it. 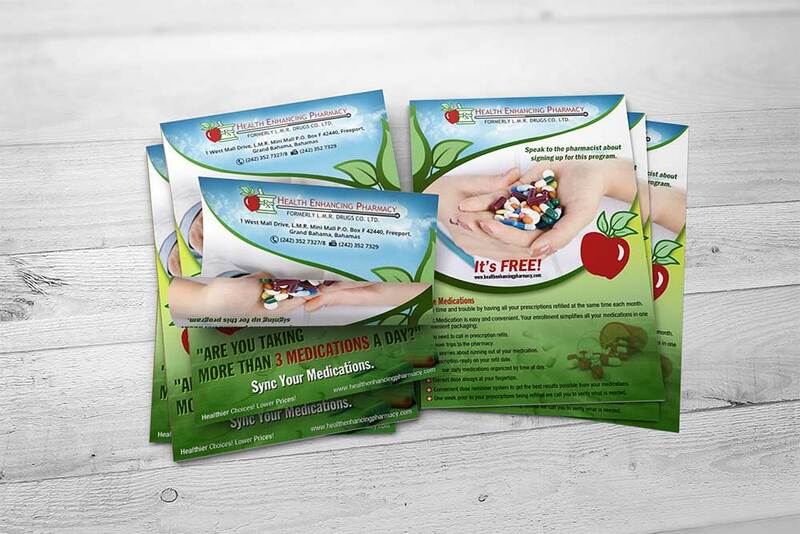 Besides, you can also use the mockup for leaflets and posters and create several different versions. If you are starting a flyer campaign purely for branding purposes, this template gives you all the needed to test out your designs. It is a high-quality PSD file with front and back view for you to cover the entire presentation and fine-tune it later on. Thanks to the smart object layer, you can now fully edit the free flyer mockup and personalize it according to your or your client’s standards and regulations. Even if you are new to mockups, the process of utilizing it is not just simple, but fun and exciting as well. It will feel like you’ve done it a couple of times before. From festivals and events to special deals, happy hours and new store openings, you can use flyers for just about anything you can think of. But when you are designing the ideal artwork, it is wise to test it out with a free flyer mockup first. This will give you a better understanding of how it will look like after you print it. It is an original presentation that will help your client visualize the final product and ask you to make any last tweaks if necessary. Create a front and a back design, plus, change the background to create a complete preview. A flyer or a leaflet, however you want to call it, is a great promotional medium that helps you spread the word out and get people interested. Moreover, you can even use this one as a postcard mockup and create something out of this world. No doubt, it is a useful free flyer mockup that gets you to showcase both the front and the back artworks on a light background. Bear in mind, just like you can change the working areas on the two flyers, you can also switch background color and even add a pattern. While you might find this free flyer mockup similar to some other alternatives on this list, there is one main thing that makes it exquisite. There are actually a whopping eight templates in the bundle for you to create a preview that will knock everyone’s socks off. Couple the front and the back of the flyer with your impressive designs and use different scenes to bring the real-time version into fruition. The task to make it a reality is simple and swift with the use of powerful Photoshop. 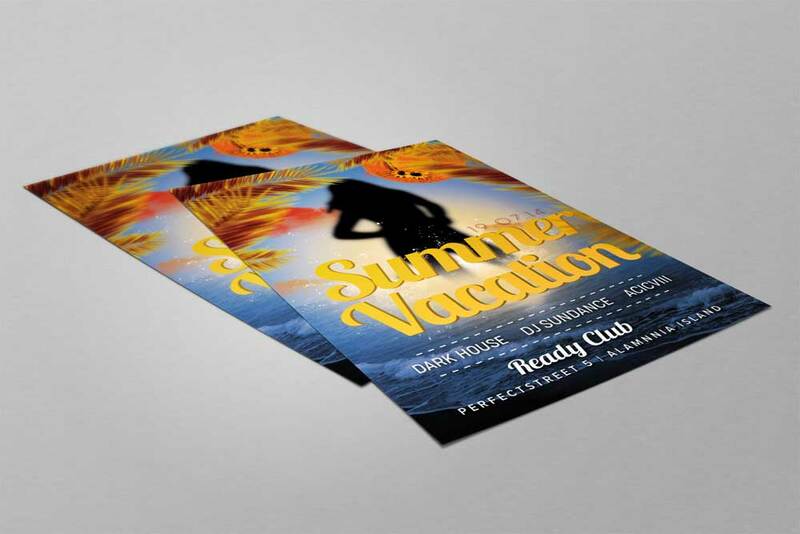 But it is the smart object layer what really makes creating a photo-realistic flyer a piece of cake. Are you a new restaurant in town? Are you bringing a new franchise to your local area? Or you might even have an insane deal going on at your store, whatever the case might be, feel free to push it with a flyer. Of course, the three mentioned are just a few of the examples what for you can use leaflets. Use your own imagination and creative spirit and come up with unique designs using this spectacular and lifelike free flyer mockup. You are in good hands so make sure you take the template to its full potential and do not miss on the rewarding opportunity a beautifully executed flyer delivers. For any type of business, a flyer or a leaflet can be a great way to promote your products or services. While this is a more formal free flyer mockup template, you can still use it for a number of different objectives. What’s super cool about the layout is the lifelike impression it gives the viewer. There are people involved and that’s what makes it special and super exclusive. That said, if you genuinely want to create a photo-realistic preview of the flyer design you work on for your client, include this bundle of mockups in the process. They will definitely dig the level of professionalism you bring to the table even with the presentation itself. Flyers can be, obviously, of all sorts of shapes and sizes. Small, large, A4, A6, rectangular or square, you name it, there are no set rules. You can easily do your thing with a non-standard size and set yourself apart from the competition. 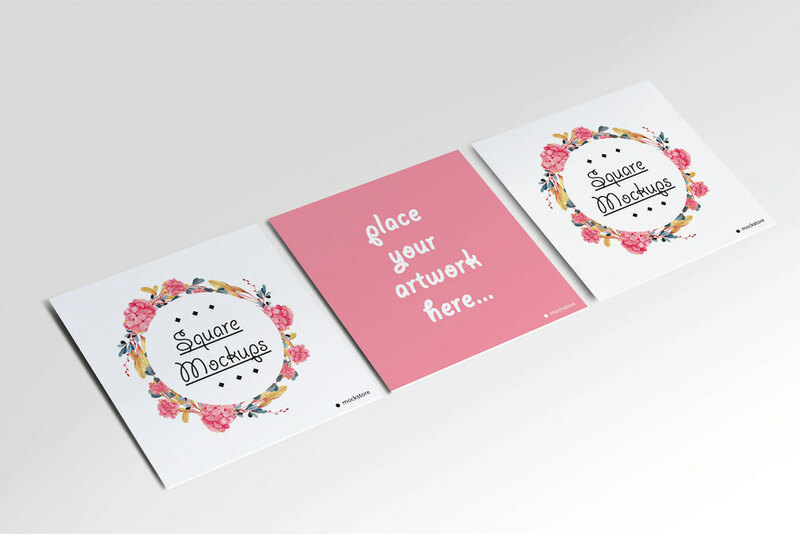 If a square format is what you are after, this is the ideal flyer mockup for you. It comes in different styles for your convenience. All you need to do is to play around with colors, add your creation and make something so inspiring they will have a hard time holding themselves back. Clean, gorgeous and refined, that’s what’s up when you utilize this mockup and bring into being your seamless design. 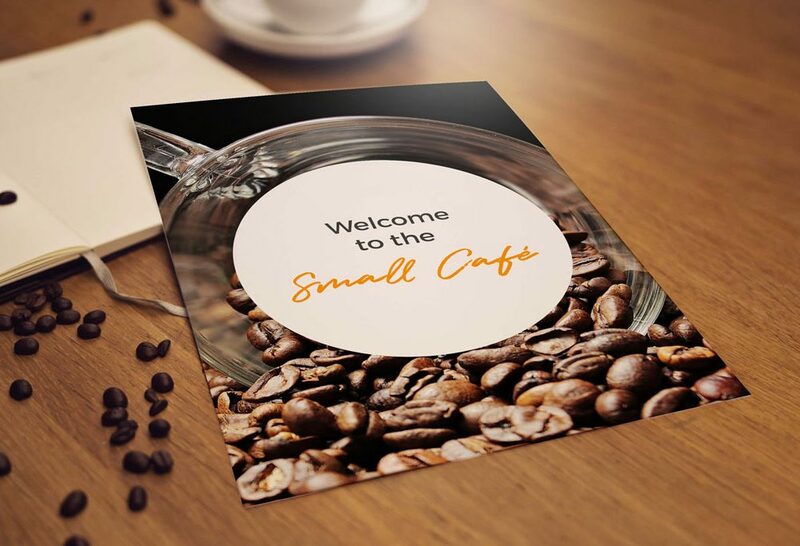 For a brand new coffee shop, a tastefully designed flyer could do a lot in regards to promotion and branding. And to make your lives a lot simpler, when designing for your client, employ this outstanding cafe flyer mockup and do things in style. With all the details, the coffee beans, the cup, the notebook and the wooden table, you know you will make a strong impression on everyone coming across your design. Besides, this A4 paper mockup could also be a great alternative to create a foods and drinks menu. Whatever you plan to do, you are guaranteed a striking outcome.